Today’s diesel engines are exposed to significant loads due to the high working pressures and demands of modern engines. It is therefore vital that sealing surfaces are ground very accurately to provide a tight seal to secure long term performance and the best possible service intervals. A grinding wheel is a precision tool with thousands of cutting points. It consists of abrasive grains held in a matrix of bond and separated by pores. The most important factors defining a grinding wheel are described below. Several types of aluminium oxide. White – brittle, colored – tensile. Used for hardened and high tensile strength materials. Dark green – black color. Used for sintered carbide, cast iron and low tensile strength material. Uses special types of bonding materials. • Used for hardened steel and high tensile strength materials. Same type of bonding materials as CBN. • Used for sintered carbide. Insensitive to temperature and solvents. • Easy to dress. 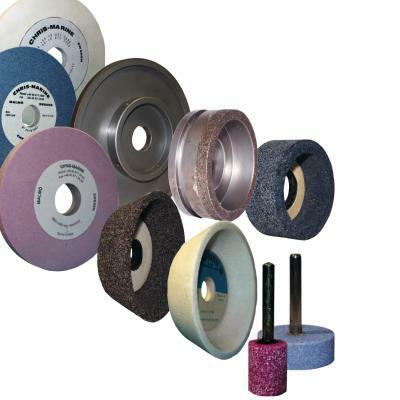 Used together with all types of abrasives. Fine finish can be achieved. Used together with CBN and Diamond. Grade is not a measure of the hardness of the abrasive material but of the durability of the wheel. The hardness varies according to the tenacity with which the bond holds the abrasive grains together. Grade is defined by the alphabetic ranging from ”E” to ”Z”. Gives a finer surface finish. Gives a slightly coarser surface finish.